To make the most of social media heavy hitters, take advantage of online tools that can help identify primo prospects and measure return on investment. Influencer marketing can yield high returns on investment, yet some still shy away from this potentially lucrative tactic. Successfully navigating the burgeoning world of influencer marketing can be tricky—especially if you’re promoting a startup or other small business. This could mean marketers are having a hard time finding influential people in a relevant niche. It could also mean they’re struggling to select specific influencers who would be best for their brand. Either way, there are two solutions to this problem. First, you should invest in tools that can help identify ideal influencers for your brand. BuzzSumo and Klout are both tremendous. Relevance. Does the influencer have a voice among your target audience? Can he or she influence people in your industry? Content quality. Can the influencer create authentic and engaging content to promote your brand or product? Does the influencer’s visual aesthetics match your vision for the campaign? Engagement. Can the influencer effectively engage an audience? The ability to create genuine connections often supersedes raw follower counts. 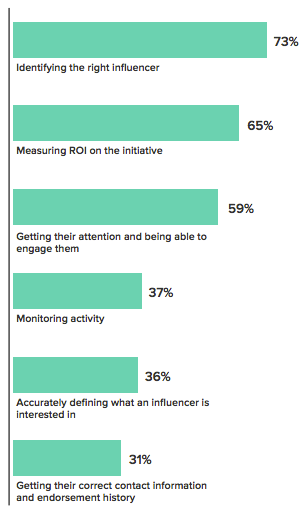 The Econsultancy study found that the second-biggest influencer marketing challenge is in measuring ROI. 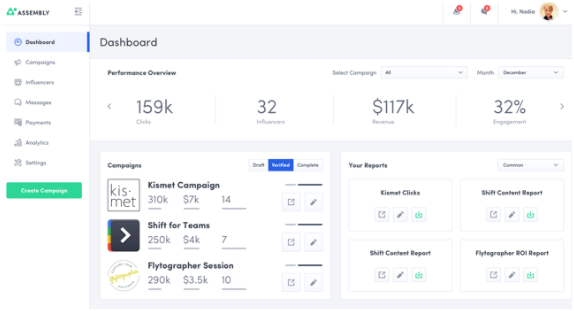 There is no magic formula to precisely measure influencer ROI, but Assembly lets you track how many pieces of content each influencer has created for your brand. It also helps you analyze the reach, views, clicks, engagement and conversions each influencer is generating. Of course, how you measure success depends on which metrics you want to gauge. Based on what your goals are, you might monitor website traffic, engagement rate, conversion rate or reach to get a sense of your influencers’ results. Fifty-nine percent of marketers in the Econsultancy study cited this issue of getting heavy hitters on board as a huge hurdle. Many influencers get proposals from hundreds of brands, so they may not have the time or patience to sift through the barrage of proposals. It’s also time-consuming to draft personalized messages for all the influencers you want to reach. The solution to this challenge lies in thorough research of the influencers you want to reach. Focus your efforts on getting to know the influencers you wish to partner with. Find out how they interact with their followers and which channels they prefer. Learning more about their preferences will prepare you to communicate in a way that appeals to them. For every challenge presented by influencer marketing, there is a resource out there that can help. Invest in a tool that can help you find influencers, study them, communicate with them, track their activity and analyze their performance. Shane Barker is a digital marketing consultant. A version of this post first appeared on Business 2 Community.